After a report revealed 8,000 complaints of physical and sexual abuse in senior care facilities were intentionally hidden from the public by DHS, Gov. Brown’s appointed officials whined that they weren’t appreciated for “never charging a fee” to newspapers who had to use public records requests to discover the missing complaints. Would Gov. Brown’s administration been honest about the rampant abuse in senior homes if they hadn’t been caught red-handed? 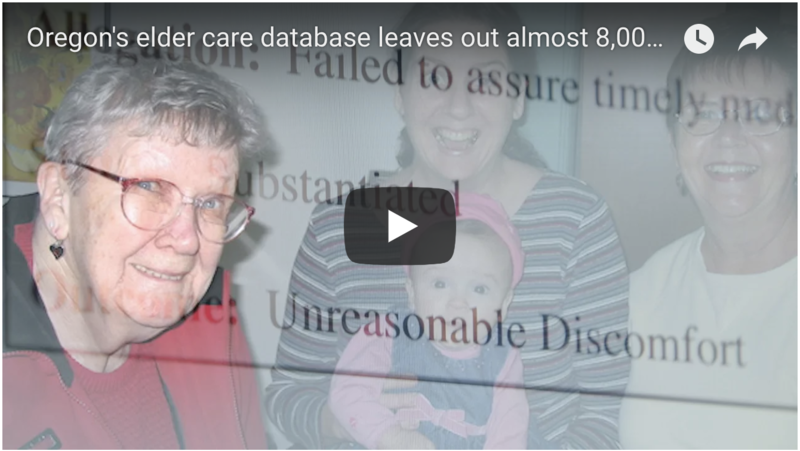 The state’s long-term care ombudsman praised a new online database created by The Oregonian/OregonLive that lists all substantiated complaints against senior care centers in Oregon. The news organization’s searchable database includes nearly 8,000 complaints of substandard care that aren’t on a separate abuse complaint database by Oregon Department of Human Services. Ombudsman Fred Steele said he will add a link to the more thorough database on his office’s website. “It’s a complete collection of incidents in care facilities that the public should know about,” Steele said Tuesday. The newsroom’s investigation revealed that the state database lacks about 60 percent of valid complaints – a vestige of a decision about a decade ago to narrow the database. None of the managers at the time now remember why that decision was made. Many people want to be reassured they’ve found a safe home for aging parents. Sometimes, they are badly misled. Nine out of 10 senior care centers had more complaints than the state’s public list disclosed, The Oregonian/OregonLive investigation showed. Steele said he hopes the newsroom’s investigation spurs the creation of a more robust complaint website by agency officials. The Department of Human Services criticized the newsroom’s investigation, saying its employees cooperated extensively with reporters and provided online and offline data. The human services agency plans to replace its online website, said Ashley Carson Cottingham, director of the department’s Aging and People with Disabilities division. But a new website could be years away. Carson Cottingham said antiquated software must be fixed first. Other lawmakers in Salem said the Legislature must do more to support oversight of care centers. Keny-Guyer is focused on a House 3359, which aims to improve training and care in Oregon’s senior care facilities. Approved by the House Committee on Human Services and Housing, it has moved to the Joint Ways and Means Committee. A companion bill, HB 3273, is expected to be retooled to increase the current low fines against facilities, Keny-Guyer said. The fate of those bills is uncertain, and they don’t address the online database. The website went up in May 2008 following years of prodding by U.S. Sen. Jeff Merkley when he was in the Oregon House. A former colleague, current Oregon Sen. Sara Gelser, has also pushed for transparent records. In 2008, she sponsored a bill that would have forced the Department of Human Services to create an online database of abuse in foster homes and adult care centers. The database would have been searchable under the name of the facility or abuser. “I wish this type of information was more easily accessible,” Gelser said. Both Gelser and Keny-Guyer expressed confidence in Carson Cottingham, who has overseen Aging and People with Disabilities for about 16 months. The newsroom’s investigation shows how vulnerable residents can be, Gelser said.